Feb 22 – Chair of Peter, The Visible Sign of Our Unity | ADULT CATECHESIS & CHRISTIAN RELIGIOUS LITERACY IN THE ROMAN CATHOLIC TRADITION: hosting ONLY True Christians!! !, or "How to think Catholic!!" “Today is the feast of the Chair of St. Peter, a celebration of the teaching authority of the Vicar of Christ. We don’t usually think of authority as a blessing, but instead as a cost worth paying for the security we enjoy—upon such philosophy was our democracy founded. Yet today we rightly revel in the great gift we have received: living under the authority of Peter. The Church is founded upon the rock of Peter, upon his confession of Jesus as Christ and Son of the Living God, revealed to him “not by flesh and blood,” but by the Heavenly Father (Matt 16:17). Through the magisterial teaching of the popes, Peter’s headship and governance has continued through centuries and millennia, and has been brought even to us. The Rock of Peter is stable, unmovable, an anchor and comfort in an age that is unmoored and lost. It is given by Christ through the bishop of Rome, the successors of St. Peter, and against it not even the gates of the netherworld will prevail. The authority of Peter is a spiritual inheritance, stewarded by the Holy Father and belonging to the whole Christian people as they are governed by that authority. But we have an image of it in a physical reality: Peter’s chair. Just as the throne is the place where a king sits to judge, Peter’s chair symbolizes his authority to definitively pronounce teachings. 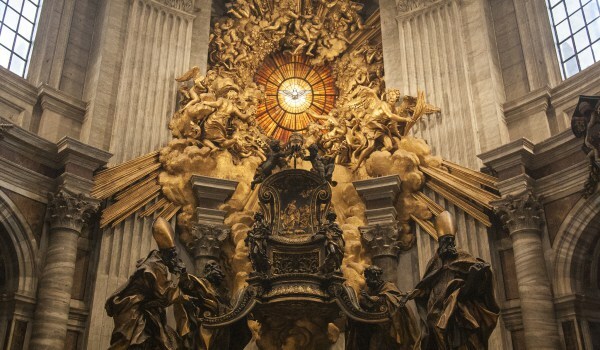 As a symbol of the original, historical chair of Peter, a 6th-century chair resides in a place of honor in Rome. Enclosed in a gilded bronze casing, it is raised in the air, halfway between heaven and earth, shielding those who shelter beneath it, visible to all who enter St. Peter’s Basilica. It is a tangible sign of the continuity in doctrine and authority that has outlived empires and despots, survived attacks physical and spiritual, and thrived amidst the challenges of erroneous philosophies and false religions. It stands fast, a rock on which we shelter and in which we can revel, thanks be to God! 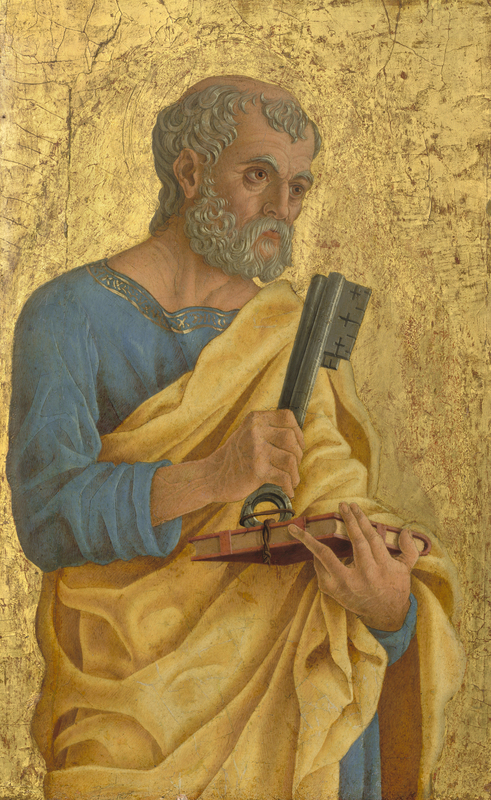 -Saint Peter (c. 1468) by Marco Zoppo depicts Peter as an old man holding the Keys of Heaven and a book representing the gospel. 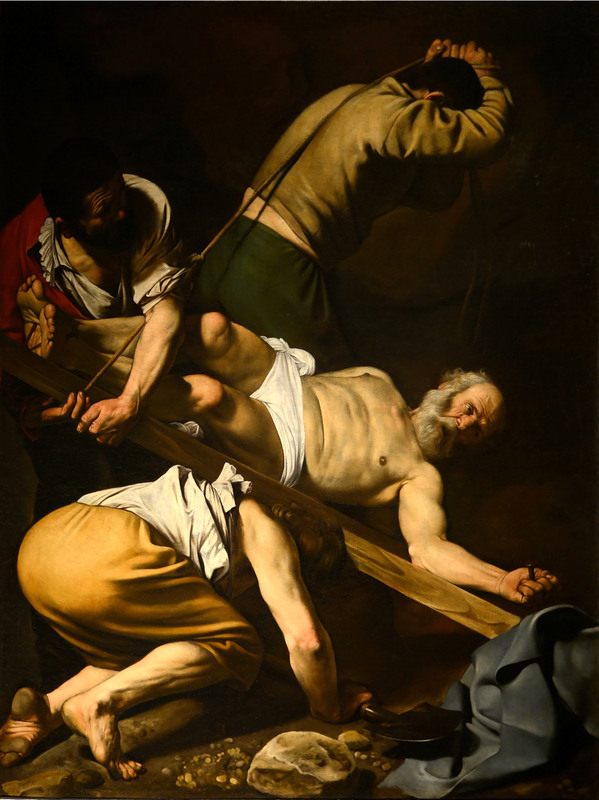 -“The Crucifixion of Saint Peter”, Caravaggio, 1600 until 1601, medium	oil on canvas, width: 51 cm (20.1 in), of detail, Cerasi Chapel, Church of Santa Maria del Popolo, Rome. Peter, feeling himself unworthy to be crucified, since he was not a Roman citizen, in the same orientation as the Lord, requested to be crucified upside down, which was granted. on the rock of the Apostle Peter’s confession of faith.